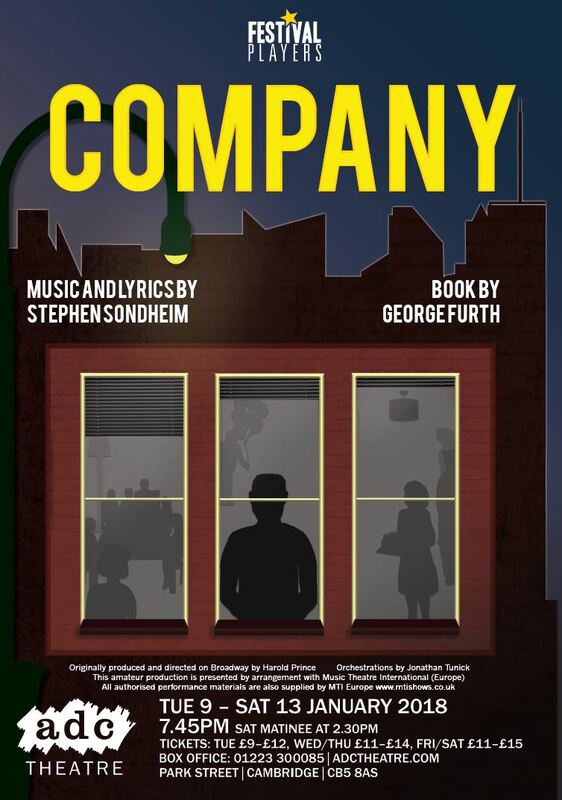 Stephen Sondheim’s Company still sounds very modern although it opened in 1970 albeit updated in the 1990s. Written in collaboration with George Furth, Company was originally a series of vignettes about five couples as seen through the eyes of their bachelor friend Robert who they are eager to rush down the aisle. There is not really a clear storyline, and so it’s impossible to summarise what exactly happens. There are, of course, plenty of songs but not too many are the sort you go home singing. Probably the most famous is ‘Side by Side’. Being Sondheim the songs are mighty complex but this first-rate cast did them full justice. Musical Director Ana Sanderson showed a good understanding of this Sondheim score, bringing some strong harmonies from the cast enhanced by her nine excellent musicians. Choreography courtesy of Rachel Hardisty was great and well executed ‘Side By Side By Side’ was particularly impressive. The backdrop of a block of New York apartments worked nicely with good lighting effects on the cyclorama throughout. I was less happy though with the lighting in general which I personally thought was rather dark overall (maybe intentional) and lighting cues on spots were off on the night I was there. The simple moveable boxes used to denote numerous acting areas worked very well. In a company which is more of a group of cameos than a cast list, the warring couples had been very well-matched in their casting. Emma Vieceli’s Amy impressed the audience with her rendition of ‘Not Getting Married’ with strong support from her put-upon husband-to-be Paul (Andrew Ruddick) and Phillipa Clark as the Church Singer. Serial divorcers Peter and Susan were in the capable hands of Karen Salter and Alistair Horne who made the couple quite engaging. Winning the award for ‘most neurotic couple’, Marshall Leeke and Gabi Fletcher as Harry and Sarah were outstanding in the second scene, packing in much humour and great characterisation in such a short space of time. Another contrasting couple, David and Jenny, was also well drawn by Magdalena Zun and Matt Brown. The three ladies in Robert’s life: Catriona Clarke, Eloise George and Samantha Billing as April, Marta and Kathy were outstanding and their rendition of ‘You Could Drive a Person Crazy’ was a highlight of the show. The whole Company gave splendid performances especially Steve Nicholson who was superb as Robert, the central bachelor figure around whom the whole show revolves. A very demanding role which Steve took very much in his stride, he proved to be excellent company all evening. Often called upon to act as ‘straight man’ to the rest of the colourful cast of eccentrics: ‘Being Alive’ was suitably poignant in his hands at the end of the show. Cat Nichol’s direction was clear and focused, bringing out the best from her cast. Congratulations to the Company of Company who worked “Side by Side” throughout.